Our journey to Phnom Penh, Cambodia, is probably one of our most unforgettable and most chilling experiences. I admit that before my visit I really didn’t know what exactly happened in Cambodia. One of great things about travelling in learning about a country, its history, its people, its culture and learning about those events you should really know about but your education system and/or pop culture references have ignored. What happened in Cambodia is a tragedy caused by humans. During the Khmer Rouge reign a quarter of the population – a whole quarter, were killed. Visiting the Killing Fields in Phnom Penh, where a lot of these murders took place was an amazing experience, intense, but unforgettable. Our day started off with a morning greeting from our tour guide, which the lovely Jess, Nicola and Annika (our new backpacking friends, who we met in the hotel bar the night before) had sourced the day before. It’s quite good if you are planning to see a lot of sights (which is why you came, right?) to negotiate the day before with a guide or driver. Then you can organise what you want to see and the price and make sure you’re up and out and not sweltering around in the hottest part of the day. Guides and tuk tuk drivers are everywhere most likely you’ll meet one when you get off your bus in Phnom Penh who is willing to take you to your hotel for free in exchange for organising your next couple of days with him. A tight squeeze but the 5 of us managed to get into a tuk tuk, which essentially is a moped with a cart on the back. So when you think about it that’s 6 of us on one moped and the weight of the cart! Needless to say we weren’t speedy and we weren’t that comfortbale but we were moving. Travelling out of Phnom Penh into the local towns and villages, through uneven dusty roads and rows and rows of shanty, tin roof housing you really got to see just how poor Cambodia is. We’d seen a lot of poverty in Vietnam and Thailand but here it was on a different level. Bare feet kids run out to wave us or shout the handful of English words they knew us. After about 45 minutes we arrived at the sight of the killing fields. Here, with a radio guide in hand we were finally educated. You pay extra for the radio guide, but it is definitely worth it. Due to salvaging not much remains of that gruesome sites apart from the graves and bones. 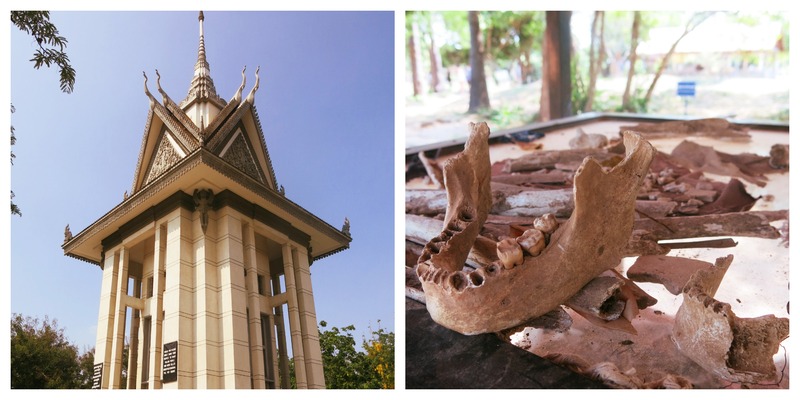 The radio guide takes you through where buildings used to be, what they were used for, where graves were found and also some really hard hitting personal accounts of people living, or trying to, in the Khmer Rouge tyranny. 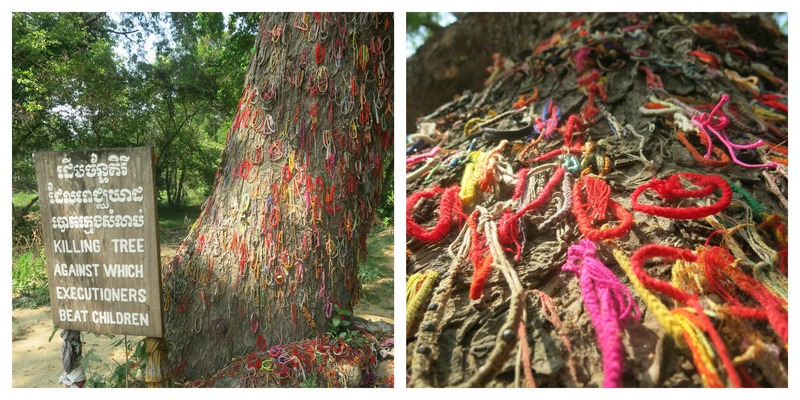 The mass graves we navigated our way round told the story of how around 17,000 Cambodians were murdered. They were brought here under false pretenses, many believeing they were being sent to Vietnam for a new life. Here they waited, locked up in buildings, as propaganda music plagued them, drowning out the sound of people outside being killed. And then when they were brought outside they were killed in the cheapest way possible. Bullets were too expensive for the Khmer Rouge. Many Cambodians were killed by being hacked, bludgeoned or some times sharp leaves were used to slit their throats. For infants, there is a killing tree etched with blood and brains. During wet seasons often bones, clothing and other remains are drawn up to the surface. 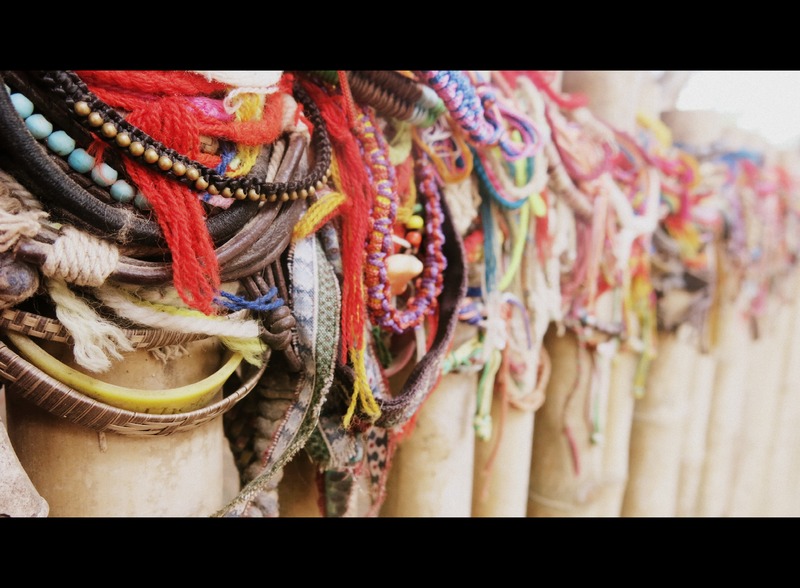 At the end of the tour you visit the towering stupa, where bones and thousands of skulls are laid out as a memorial to those that lost their lives here. I think the killing fields is something you have to kind of comprehend on your own, at your own pace, and the radio guide let’s you do that. It’s quite hard to explain but I think with the guide and its contents really give you a connection to the Cambodian people, setting the scene of what used to be and what remains now. With your own thoughts you can really get lost in the tragedy. Like I said at the beginning of this post, it’s a chilling yet unforgettable experience.